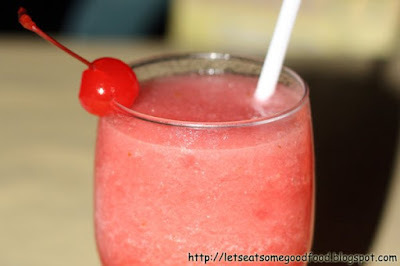 Watermelon Shake Recipe – Eats Yummy! 1 cup seeded and cubed watermelon, use the sweetest one you can get. Using a blender, combine all ingredients until mixture is slushy. Pour in two 8 ounces glasses. Put some cherry or watermelon slice on the tip of the glass. A simply delicious drink. Yum! Wow… that looks SO refreshing. Love it! watermelon is my all-time favorite fruit 🙂 thanks for sharing.